My first ECS meeting ever was this past May in Orlando. It was a wonderful experience. Although a bit like getting pushed into the deep end. While we were there we created this video (first of two coming your way) about ECS meetings. I was forced to start talking to people — not just talk, but convince them to be on camera and answer my questions. No better way to make friends! In the end it was simple enough, just ask the scientists and researchers why they come to the meetings. Speaking of meetings, we just opened EARLY BIRD registration for our next one in Cancun. The 2014 ECS and SMEQ Joint International Meeting will be held from October 5-9, 2014 in Cancun, Mexico at the all-inclusive Moon Palace Resort. 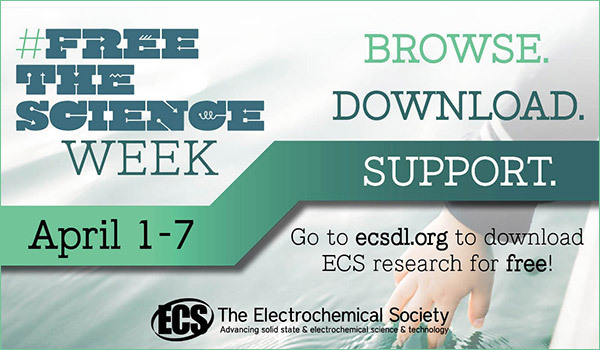 This major international conference offers a unique blend of electrochemical and solid state science and technology; and serves as a major forum for the discussion of interdisciplinary research from around the world through a variety of formats, such as oral presentations, poster sessions, exhibits, and tutorial sessions. 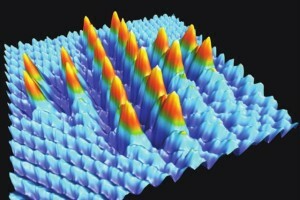 20 bromine atoms were positioned on a sodium chloride surface using the tip of an atomic force microscope at room temperature. The first successful systematic atomic manipulation on an insulating surface at room temperatures has been achieved and presented by international researchers at the University of Basel, thereby taking the manipulation of atoms to a new level. Below is a question raised in a discussion going on in our LinkedIn group. Consider joining. I am looking for pressure sensor monitoring in a battery pack so that I can track the volume expansion of polymer or prismatic cells in a battery pack. Is anyone aware of any vendors that can provide samples of such sensors in consumer applications? We have over 3,600 members in the group, ready to discuss. If you have the answer to the above question, feel free to enter in the comments here. I’ll get it to the right place. Find out more about our divisions, including the Batteries, Fuel Cells, and Energy Conversion Division. Easy-to-search, high-tech platform ensuring a progressive atmosphere for the exchange of knowledge and ideas. Effect of Relative Humidity on Corrosion of Steel under Sea Salt Aerosol Proxies I. NaCl – This paper is the first of two that examine the relationship between relative humidity, the hygroscopic behavior of sea salt aerosol proxies, and the atmospheric corrosion of mild steel contaminated with them. Effect of Relative Humidity on Corrosion of Steel under Sea Salt Aerosol Proxies II. MgCl2, Artificial Seawater – This paper is the second of two that examines between the hygroscopic behavior of sea salt aerosol proxies and the atmospheric corrosion of mild steel contaminated with them. Corrosion Inhibition of Zinc by Aqueous Vanadate Species – This study presents a characterization of the degree and mechanism of corrosion inhibition of Zn by vanadate inhibitors. NPR take several talks that fit into the episode’s theme, replay parts of them, and often interview the speakers to get more insight. 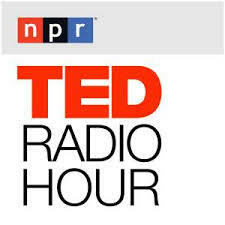 The Ted Radio Hour is an NPR show that features TedTalks (shame on you if you have never listened). NPR take several talks that fit into the episode’s theme, replay parts of them, and often interview the speakers to get more insight. A recent episode caught my ear —What is Original? When is copying flattery, when is it thievery, and when is it sheer genius? In this hour, TED speakers explore how sampling, borrowing, and riffing make all of us innovators. In particular was the section with writer Steven Johnson’s TedTalk — Where Do Good Ideas Come From? Earlier this year, Tesla Motors CEO Elon Musk decided to give away his company’s patents for free. It might seem like a strange business move, but Musk said he wanted to inspire creativity and accelerate innovation. Writer Steven Johnson says this is the way great ideas have been born throughout history. ECS blogger Dan Fatton commended Tesla recently. Turns out people are seeing that Open Access, a concept ECS is dedicated to, is where good ideas come from. Here’s something you might not have considered — Reddit. It calls itself a “platform for internet communities where your votes shape what the world is talking about.” There are a range of topics on Reddit, some not for the faint of heart. But you can find some science sub-Reddits. Here’s the general science one to get you started. It has close to 6 million subscribers. That’s a lot of power. You also might be interested in the AMAs (Ask Me Anything) in the right column. They’re Q&As with scientists. It’s just for fun, but be warned, it can be a deep rabbit hole once you start. Atomic Layer Etch (ALEt) and Atomic Layer Clean (ALC) are emerging as enabling technologies for sub 10nm technology nodes. At these scales performance will be extremely sensitive to process variation. Atomic layer processes are the most promising path to deliver the precision needed. However, many areas of ALEt and ALC are in need of improved fundamental understanding and process development. This focus issue will cover state-of-the-art efforts that address a variety of approaches to ALE and ALC. What is clear is that an important part of the future is the increasing adoption of Open Access. Since the dawn of modern science, the key to scientific advancement has been the exchange of knowledge in publications, meetings, and through other collaborations; and in the past decade we have experienced a significant change in the way this scientific exchange occurs. Digital information and the Internet have dramatically improved our ability to disseminate science on a worldwide scale and should lead to global advances at a pace never considered before. But there are obstacles because these technological advancements in the digital age have come at a high cost to scholarly publishing; not for producing scientific content but for the cost of dissemination incurred by users of the research and their institutions.